It's humid and in the 90s, the sun is high in the summer sky, and it's time for blueberry picking! We picked ours a couple of weeks ago, on an organic farm not too far from our house. I love picking fruits and berries in the summer, but I find blueberries most enjoyable. Maybe it's the way that the abundance of berries just falls into your hands; maybe it's that the bushes are at arms level. Or maybe it's just that it's the first fruit we pick in the season. In the hustle of beginning summer, we have to remind ourselves to pick before the season ends (in our area, by mid-July). When we're picking blueberries, I know it's summer. I discovered fruit picking later in life. I grew up in smoggy Philadelphia summers, taking long bus rides to a day camp where – with limited athletic ability, allergies, and a fear of bees – let's just say I wasn't the most popular girl in the bunk. And I must say I'm not much of a green thumb. Growing up, my mother would periodically send our houseplants to a friend to resuscitate them during the summer, and I myself have never managed to keep a houseplant alive more than a year. However, I began picking fruit (that others grow) about ten years ago and I've been hooked ever since. My first opportunity to pick apples came when I organized an environmental team at my synagogue in the early 2000s. 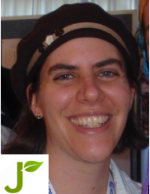 I wanted to talk about Torah and the environment. They wanted to pick apples. I said, "Great, let's go pick apples and we can talk about Torah and the environment while we're there." And so we did. We talked about the blessing over fruit (blessed are You, G-d, for creating the fruit of the tree) and how each blessing reminds us not only that G-d created the food but where the food came from. When you say this blessing over the apple while standing next to the very tree you picked it from, it all makes sense. I remember my own sense of awe at this experience; standing a field of apple trees so hilly and wide that you couldn't see any cars even in the distance, saying a blessing over the very apple next to its very tree. The gift of this fruit. Berries receive a different blessing (like vegetables, "for creating the fruit of the earth") but to me, they seem just as miraculous. I know that not everyone has the opportunity to pick blueberries, but almost everyone has a farm near enough to pick something this growing season. I highly recommend it. See where your food comes from, and say the blessing "fruit of the earth" or "fruit of the tree" while standing next to the very "tree" or "earth" that that fruit came from! I picked up an organic blueberry bush at Whole Foods in Rockville a few weeks ago. I noshed and shared the blueberries as they ripened. I finally got around to taking it out the pot it came in and planting it this week.